Maybe it's staying home weekends instead of traipsing off to dog shows here, there and yon, but I am spending more time being a homebody, and much more time in the kitchen. Laura P and I were talking one day about how much we love Snapple peach tea, and I got a wild hair to go buy a flat of peaches and make a batch of peach syrup. 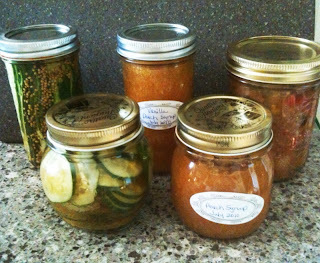 I found a recipe on the net, bought some jars at Ace Hardware, and made a batch - YUM! While I was at the vegetable stand getting the peaches, I saw some pickling cucumbers (4 for $1!!) and thought about how I love those cold pack chilled dills, so I bought some of those too. Found this recipe, and oh, YUM AGAIN! This recipe cought my eye when I was looking around, because I had some cilantro in fridge I needed to use, so the next time I was at the veggie stand I bought some green tomatoes, and gave this salsa a try. Do I say it again? Yes, YUM! Yesterday I stopped by the veggie stand just for some grocery shopping, and they had baskets of peaches and picking cukes and green tomatoes calling out to me, "take us home and can us!!" I resisted. Ok - I did bring home just 4 more cukes, just to replenish my empty jar in the fridge and to make one more batch cut lengthwise for sandwiches. I walked away from the rest, came home and pulled out the premium list for the Western Reserve show. It closes this week, and I'm thinking I need a dog show to break my canning habit! Have you caught the canning bug? I like to freeze fresh produce but some items just don't freeze well. Looks like you made some good stuff! I didn't can as much as I wanted this year, missed out on the okra since I was gone. Did get lots of jam/whole fruit though. All of it looks yummy! I wish there was a practical way to ship peaches. My tree is loaded with small but very sweet fruit. I'll take bags up to the Training Club and let the less fortunate take whatever the want. You are turning into a real Suzy Homemaker! Can't wait to sample some of those yummies! I had that bug last year. My husbands favorite was the hot pickled green beans. All of yours look great.